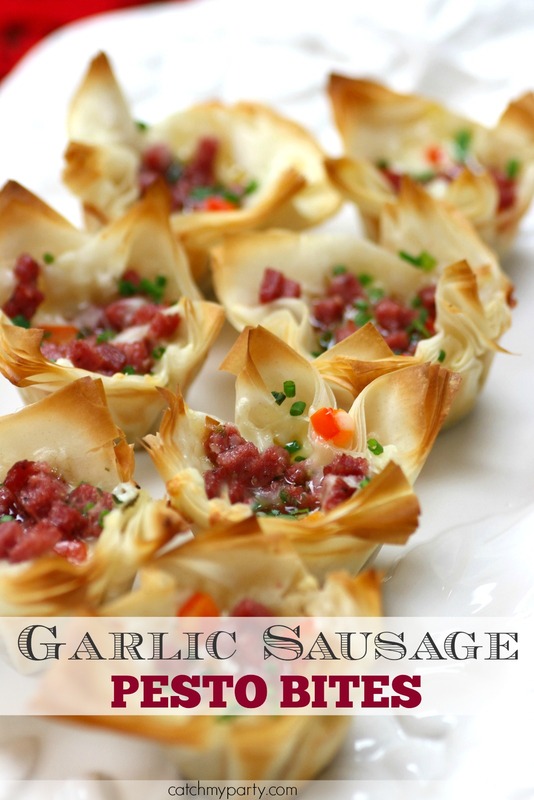 These garlic sausage pesto appetizer bites are the perfect dish to serve to your guests this holiday season! And I promise you won't be able to eat just one, and nor will your guests. 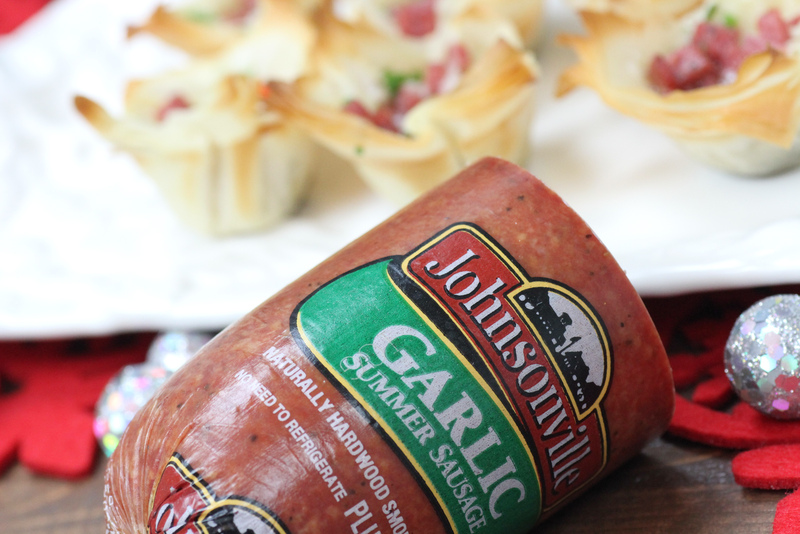 The star ingredient is the garlic Johnsonville Summer Sausage. The sausage is filled with the best cuts of meat and smoked over real hardwoods, and you can definitely taste it in it's smoky, rich, umami flavor. Plus I added a dab of pesto, some jack cheese, bell pepper, and scallions to each bite. 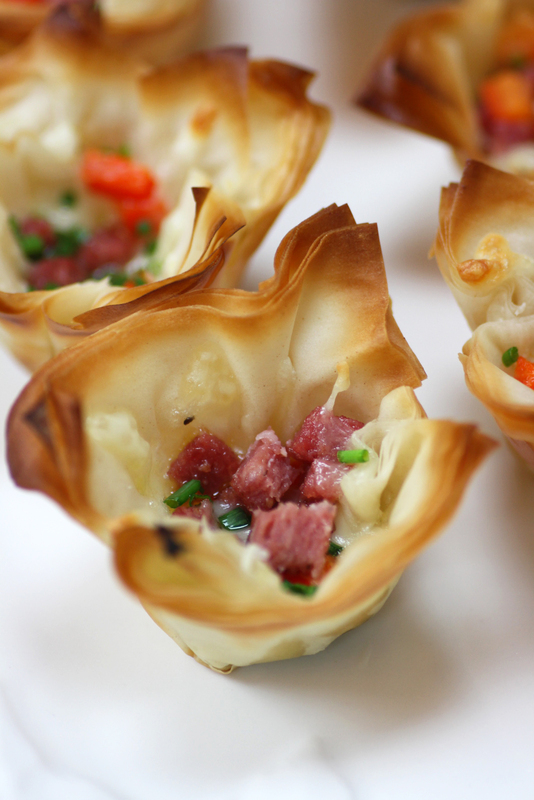 And it's all held together in a little cup of phyllo dough. I've heard so many horror stories about how hard phyllo dough is to work with. I actually found it easy and straightforward. Plus the phyllo dough added a buttery, flaky, base for all the other flavors to pop. Here's how I did it. Start by preparing your phyllo dough. Spread out one sheet of phyllo dough on a large cutting board. With a pastry brush paint a layer of melted button on the sheet. Place another sheet on top. Again, spread on a layer of melted butter. Repeat until you have 5 sheets stacked. 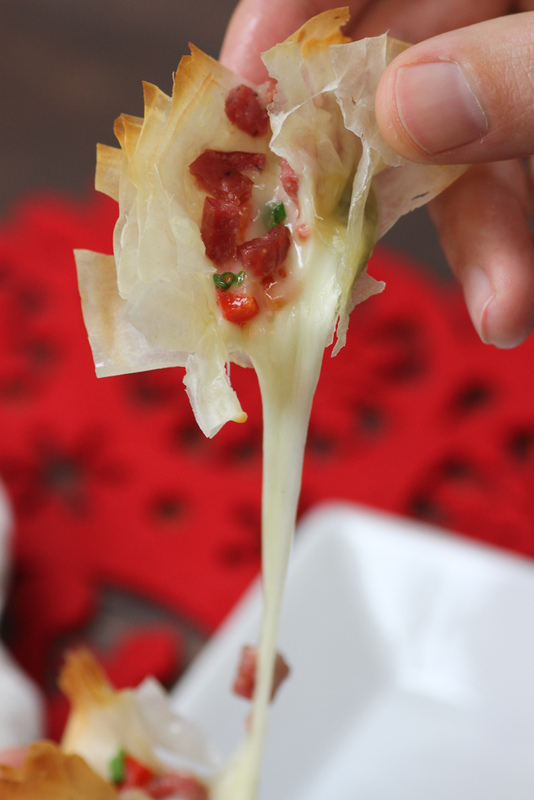 Using a sharp knife, cut phyllo dough into three inch squares. 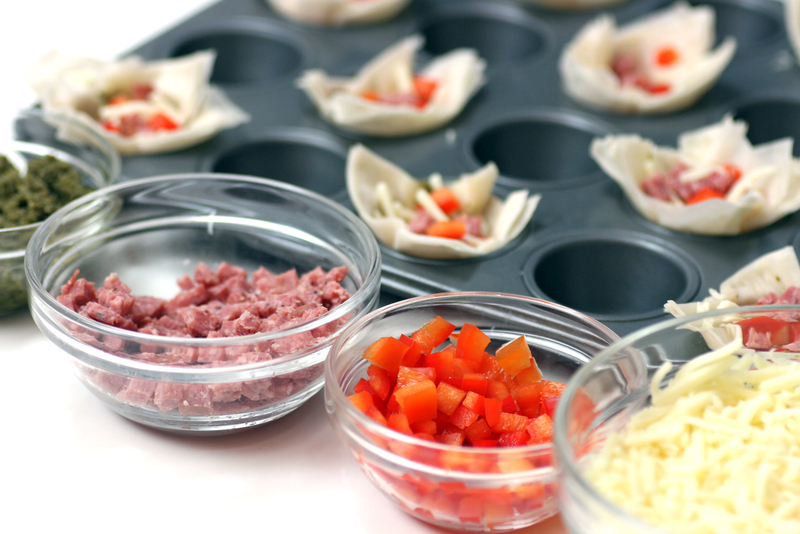 Place each square into a mini muffin tin making sure to press the square down so to create a cup. Next start adding your toppings. 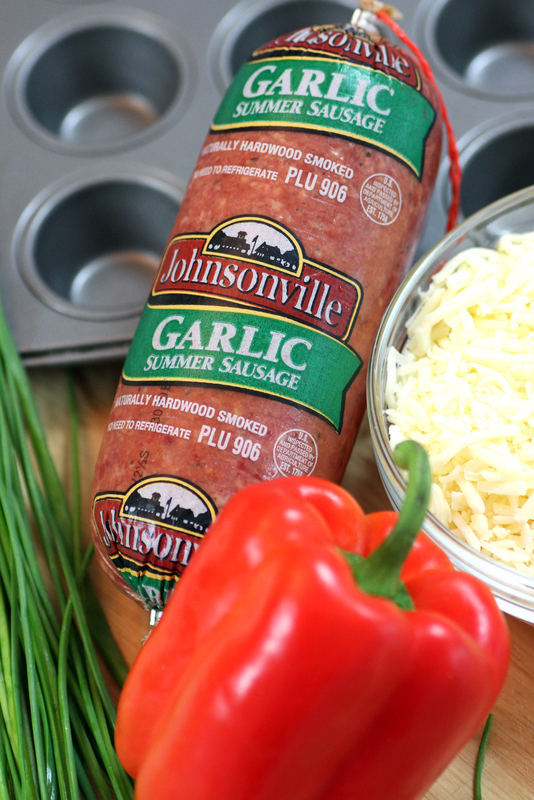 Spread a teaspoon of pesto sauce on the bottom of each cup, followed by cheese, peppers and garlic sausage. The cheese will cook down so be sure to fill the cups full. Bake at 400F degrees for 6 minutes, or until the tops of the phyllo dough start to turn a goldern brown. Sprinkle with chopped scallions and serve them right out of the oven so the cheese is nice and melted. Enjoy your holiday! 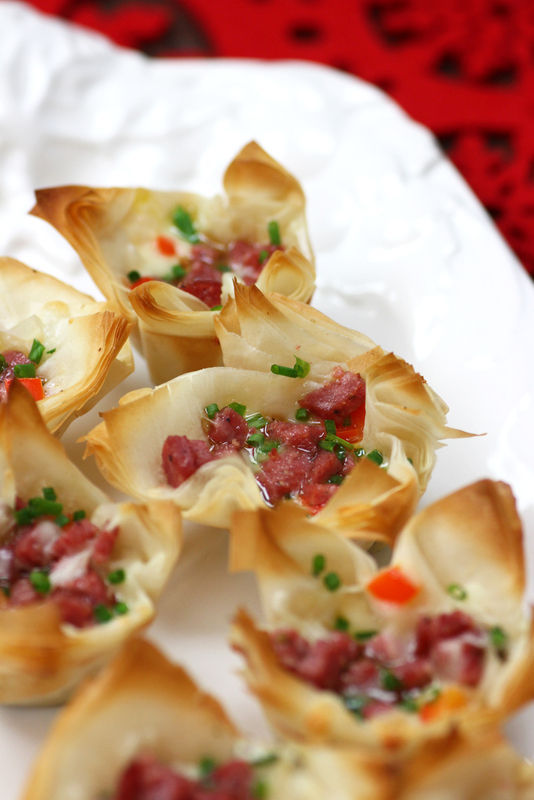 And make your entertaining easy and delicious with these appetizer bites. Host your party between meals so you can serve an assortment of appetizers, like the one above, and don't have to prepare a full meal. Serve a signature cocktail, like a cranberry orange martini, plus some wine and beer, so you can simplify your cocktail offerings. Give your guests something sweet to go home with, like a small bag of cookies or biscotti. It leaves a sweet taste in their mouths. Relax and enjoy your party! I always set this as my intention right before the guests arrive. This helps me not get swept up in the details so that I can connect with my guests and have fun!